Travels with a Tin Donkey: Book Review: "Beyond the Finish Line"
Book Review: "Beyond the Finish Line"
Unlike other sports that take place in a confined environment—the tennis court, football stadium, or cricket pitch, for example—bicycle road racing is open to the elements and events take before a diverse backdrop featuring geographic highlights of many countries. Add to this ever-changing weather, different road surfaces, colourful jerseys and colourful personalities and the rolling circus atmosphere provides the photographer with limitless opportunity. 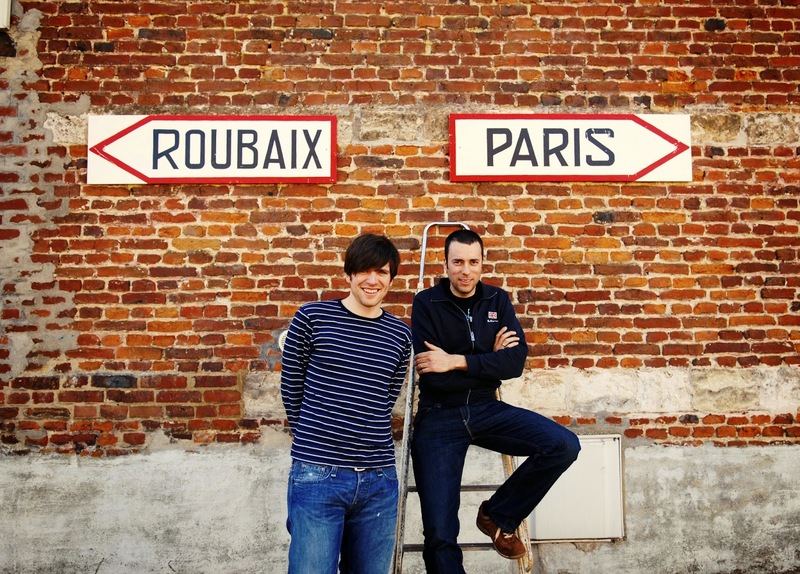 So what we have is a kind of art book, with cycling as a unifying theme. There are no captions to the photos, although the event is indicated (“Tour de France 2013,” “Paris-Roubaix 2014,” “Amstel Gold 2013” to note the famous ones; “Circuit Race Baarlo 2014,” “Arctic Race of Norway 2014 (! ),” “Boxmeer “Daags Na De Tour” 2013” to name the less obvious). The photos are all of a technically high standard and include close-ups of fans, long shots of the peloton in action, moments of intense action and others of serene reflection. For those having experienced the thrill of pro racing in Northern Europe, many of these photos will be highly evocative. Particular favourites would include a gentle downhill between the crowd barriers, the rolling hills of Limberg ahead, during the Amstel Gold race; or Paris-Roubaix in 2012, with a lone rider challenging the pavé, emerging from the darkness on the right side of the photo. Another superb photo shows the group speeding along the cobbles through the Arenberg Forest, a kind of divine light shining down, spectator-witnesses in near-darkness. Many of the photos are not necessarily realistic but have been treated to highlight elements. For example, the grey starkness of Mont Ventoux set off only by some red Carrefour banners and the red of the weather station tower at the top. In addition to the evocative photos, there are some charming short essays by Tim Farin about the pleasures of cycling, mixing the joys (and pains) of the amateurs with the world-weariness of the professionals or observations of their lives. The pieces are not linked to specific photos but are a scripted counterpoint to the images. 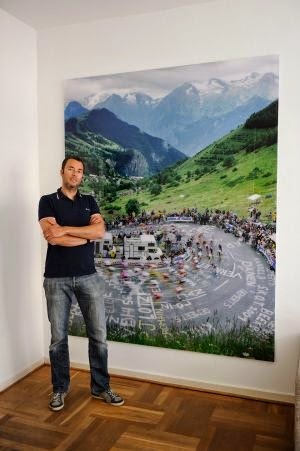 In addition to the photos taken primarily in 2012-2014, there is a wonderful image of the 2001 Tour on the Alpe d'Huez, “La Photo,” which was printed in an edition of six in the massive dimension of 1.80 m x 2.30 m. It was shot on a large format camera and one of the prints can be seen the Tour of Flanders Museum in Oudenaarde, Belgiium. There are still some prints available and after enjoying “Beyond the Finish Line” one might be tempted to clear up wall space for this artwork. Also available through the website are fine art prints of many of the photos featured in the book.